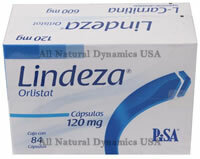 Lindeza contains Orlistat 120 mg which blocks up to 30% of the fats in food. Lindeza should be taken 3 times a day 30 minutes before meals containing fat. It is indicated for the treatment of obesity in conjunction with a low calorie diet plan and exercise. Lindeza works in the digestive system to block about 30% of the fat from the foods you eat before being digested and converted into fat. In order to ensure adequate nutrition it is recommended the use of a multivitamin supplement which should be taken at least one hour after taking Lindeza. 84 Capsules with orlistat 120mg.